(Latest Updated : 15.02.19). RPSC College Lecturer Interview Admit Card 2019 are available here for College Lecturer Interview 2019. RPSC has declared written test result of various subjects of College Lecturer Exam 2016. Qualified candidates are called for Interview for the post of College Lecturer in Rajasthan. Interview Dates and Interview Letter can be checked here. Rajasthan Public Service Commission (RPSC) released Hall Ticket or Roll Number for RPSC College Lecturer Interview Schedule 2019 as per the schedule . RPSC declared exam result of College Lecturer Recruitment 2015-16 for various subjects. Candidates who appeared in college lecturer exam 2016 for Paper-I, II & III can download their result from the official website of RPSC i.e. www.rpsc.rajasthan.gov.in. Check here result, admit card and latest interview dates of RPSC College Lecturer Recruitment 2019. The commission will hold college lecturer interview 2019 for various posts of College Lecturer of qualified candidates in written test of College Lecturer Exam 2016. Online exam for paper-I & paper-II was held from 21.06.2016 to 09.07.2016. Online exam for paper-3 of general nature (Rajasthan GK) was held on 24th April, 2016. Interview Admit cards will be released by RPSC as per the schedule and candidates can download the admit card as per the schedule at the official website. College Lecturer Interview Admit card 2017 are available here as and when the admit cards are uploaded by RPSC. RPSC will conduct interview for the post of College Lecturer of qualified candidates of College Lecturer Written Exam 2016. College Lecturer Comp. Exam 2014 was held in 2016 and written test result has been declared for various subjects.Qualified candidates in written test will be called for interview as per the schedule. Candidates can check latest interview schedule of RPSC College Recruitment 2018-19 here. Check link for RPSC College Lecturer Exam. Qualified candidates can download their interview admit card for college lecturer Interview 2019 either through the steps cited above or through the official link provided here. Download admit card at the below link. 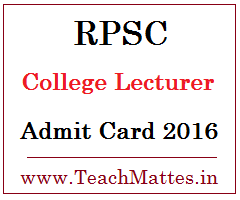 Download RPSC College Lecturer Interview Letter for A.B.S.T.